The 15.6" GIGABYTE gaming laptop P35X v5 features the brand new Skylake 6th generation Intel® Core™ i7 processor and latest generation NVIDIA® GeForce® GTX 980M gaming level discrete graphics with GDDR5 8GB VRAM. Designed to impress and outperform, P35X v5 takes what meant to be played on desktop PCs to a mobile platform- with uncompromised mobility and unreal performance. Thanks to GIGABYTE exclusive Supra-cool Technology, the quad-storage system can manage two 512GB mSATA SSD and a pair of 2TB HDD* within a 20.9mm chassis yet maintaining outstanding thermal capability. The hot swappable HDD slot creates exceptional flexibility while WQHD+ wide viewing angle display* delivering superb viewing experience, plus a premium stereo subwoofer and Dolby® Digital Plus™ Home Theatre for uncompromised audiovisual entertainment. 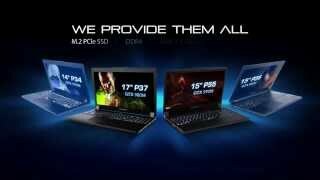 The 15.6" gaming flagship has raised the bar set by its predecessor for slim gaming laptops to a new level. The Skylake 6th generation Intel® Core™ Processor brings revolutionary power efficiency, resulting in improved battery life. The breathtaking performance offers rapid data / multimedia processing speed. Unleash the ultimate computing potential on your P35X v3! The 1080p Full HD display grants wide viewing angle, rendering vivid colour and sensational impacts. Sharing game scenes with your partners will no longer be a problem. More links for "P35X V5-CF2 15.6" FHD IPS, Intel i7-6700HQ, NVIDIA GTX 980M 8GB GDDR5 Gaming Laptop"
"This combination of hardware should have little trouble ploughing through the latest games at a native 1080p resolution, and does so in a sleek-looking package that has the power and presentation to double as a daily workhorse."